These courses build pride in your performance and create a standard of competence for all those who handle 4x4s in a work situation. More than ever, regular maintenance is crucial to the working vehicle and we make sure that drivers know exactly what is needed. A well looked after machine will perform better, for longer and safely ensures that you get the most from your investment. Vehicle and driver specific, this course is designed for individuals and organisations using 4x4s as part of their business, meeting the needs of the professional driver by making the best use of the vehicle both on and off-road. The investment can only be effective if the operator is aware of correct driving techniques, proper handling and loading which contribute to safety and help to keep maintenance costs low. Correct choice of tyres reduces impact on the environment, avoiding damage to the countryside. 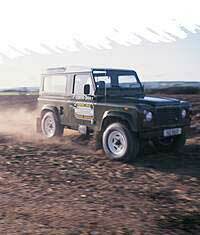 Other topics covered can include winching techniques, recovery etc all tailored to individual needs. This covers preparation of the vehicle including visual checks, jacking, safety, general driving techniques including diff locks, gearbox etc. 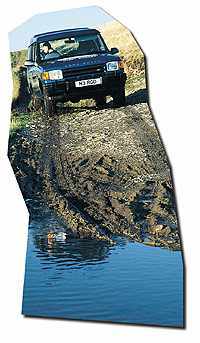 All off-road techniques are explained with detailed coverage of different ground types, wet crossings and fording. This stage is carefully structured to suit the professional client with their own specific needs, vehicle use and vehicle type dictating the content. You get the course that you need. Organisations such as the Police, mountain rescue teams, The Countryside Commission, Scottish Power and The SEPA, The British Geological Society, Historic Monuments Scotland and The National Museums of Scotland rely on him for driver training. Quad-bike driver training is also available, tailored to your individual requirements. This is a three day specific course and covers all off and on-road use of the vehicle together with all basic instructing skills. The driving skill elements of the other courses are enhanced with a comprehensive introduction to the capabilities and requirements of the vehicle. Day one is spent assessing your ability to drive off-road using the correct techniques. Day two discusses teaching methods, how to prepare lessons and use visual aids to make your job as an instructor as easy and successful as possible. On day three your instructor becomes your pupil, making mistakes and expecting you to correct them. Its one thing to be able to drive off-road competently yourself, but quite another to be responsible for every action of your pupil. Everything may have been explained thoroughly but you must anticipate every wrong action before your pupil even thinks about it. This comes with both experience of driving and of teaching. Participants in this course must be over 21 and have a clean driving licence. Additional to basic driving techniques, this on-road course is designed to improve overall driving skills, confidence and increased awareness of risk, leading to safer driving. The course is run in a controlled environment where you can get to know your own personal limits and those of your vehicle and determine your ability as a driver in the safety of a closed track. For many people, a trailer is a practical and economical means of transporting bulky goods or livestock. A caravan is wonderful for holidays and a horse-trailer is much more economical than a dedicated vehicle and, with a little training, is very easy to tow. A 4x4 is the ideal towing vehicle; power is available at low revs, the substantial chassis easily copes with the extra load and four wheel drive is available to get you out of wet and muddy corners. The first aim of this course is safety. We teach you the skills to keep yourself out of trouble: checking the trailer, hitching up to the vehicle safely and within the law. You find out how heavy a load you can tow, how much overhang is allowed, what speed you can drive at and what lights you need. The sequence of hitching and unhitching is explained together with how to ensure the correct noseweight. Once you are properly hitched up, you learn the skills needed to drive both on and off-road: stopping, reversing, loading and unloading. All of this instruction is carried out to D.O.T. licence standard. All new drivers require a licence for towing. This course aims to make you a better and safer driver on slippery surfaces such as mud, snow or wet or flooded tarmac. The aim is to increase your awareness of the dangers of lower friction and to provide practice driving in these situations. You will learn how to anticipate where problems might arise, what techniques are best for a situation and what to do to control a skid safely. This course is aimed at anyone who wishes to be able to handle any type of vehicle in a difficult or emergency situation.